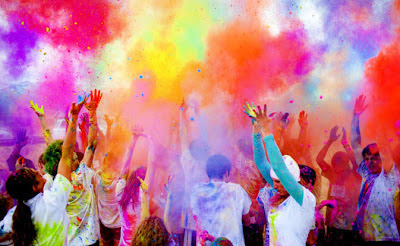 linzlinzlinz: Color Me Rad? You Betcha. This blog has really taken a turn to dealing with 'body image' issues, hasn't it? Oddly, I don't really think I'm that concerned with it all. Maybe I'm lying to myself right there, maybe I'm not. Either way - let's talk about it some more, shall we? So, if you've known me for very long, you'll know that I am a complete and total sucker for crowds, events, parties, concerts, and any public forum where people are all gathered together for a common interest or excitement. In my younger years I thought it was because I lived and breathed for parties. As I've gotten older (not old, mind you) I've realized it's because I get a serious rush from things that bring together communities. Hang around outside of IKEA for hours the day of the grand opening? Perfect, I'll be there. Sleep out in a tent on a busy road for a good parade spot? Absolutely. Stand in sub-freezing temperatures for 9 hours without food, water, or a bathroom just to claim the experience of New Year's Eve in Times Square? Been there, never regretted a second. After my oldest daughter was born, I started running. I'd never really run before, but I lived next to a superhero of a woman who came from a family of runners. Somehow she inadvertently inspired me to start jogging as a leisure activity and I actually grew to really like it. Don't get me wrong here - I was never very good at it. I never ever ever could run faster than a 10 minute mile, and even that wasn't all that common. Nevertheless, I liked it just the same. One day this superhero friend mentioned an upcoming 5K that was happening as part of our little town's yearly celebration: Art City Days. She mentioned the run was low key and more importantly that there were TONS of prizes they raffled off after the race was over. VERY reluctantly I registered, felt intimidated at the very thought of participating in a race, but couldn't pass up the prizes! I made a glorious discovery the day of that race. Guess who runs in these races? Everyone. All types of people, all walks of life. We're not talking 10K or 1/2 marathon here - we're talking a 5K - that's just barely over 3 miles. There were kids, pregnant women, grandparents, and everyone in between. The morning of the race, I jogged up to the local high school (which was just up the road from my house) and I felt a very distinct sense of community. I was hooked. I ran that race - I did pretty terribly, really, but I LOVED it. There was such a rush that the 3 miles didn't even seem that difficult and people were so excited that it was easy to forget that there were plenty of people more than twice my age that were regularly passing me by. I mean.... COME.... ON. Could there really be anything cooler than THIS?! I dare say NO! I registered for the Color Me Rad 5K within about 15 minutes of learning that there was going to be one here in Orem where I live. I also noticed one in Virginia Beach (my homeland) just a week after the one by me! My friends here AND there can bask in the glory of this race/party. After registration, I landed on a committee for a local Blogger Retreat called Breathing Space. I was thrilled to learn that Color Me Rad (@ColorMeRad5K on Twitter) was one of the sponsors. I was even more thrilled to learn that I was going to have the opportunity to GIVE AWAY TWO FULL REGISTRATIONS to any Color Me Rad 5K being hosted anywhere this year throughout the country. Stop thinking about this - just enter. You know as well as I know that you're dying to be there. So- here it goes. Follow the directions below to enter! Good luck - and happy running. Done and done!!! Love your blog! You'll have to show me a thing or two bc I love your set up!!! Our family is coming down from Alaska for a wedding. What a great way to end our trip! Thanks for the opportunity! I ran the Family Fun Run/ Art City days last year. Loved it. Doin it again this year. My hubs works for Nestle USA at the Stouffers plant. I am thinking about the ColormeRad run but not to sure about the actual Color part. The mess scares me. LOL Can not wait to meet you at the Breathing Space Retreat. Yeah!!! Are you going to the Queen Bee Market at Snap? I am. Not the conference though.... So Sad! I'm going to do my best to be at the Queen Bee Market, keep your eyes peeled for me. And yes! Do the Color Me Rad run - forget the mess, it's going to be worth every single second! This would be so much fun to do. Thanks for the giveaway! Yes. I emailed the winner on Saturday morning and gave her until tomorrow morning to respond. If she doesn't - I'll be drawing another winner so stay tuned!